Those are precious words to us Texans. They bring up memories of fall weather, carnival rides and fried food! I admit that I haven’t been to the fair in many years but couldn’t pass up a chance this year with the boys. I knew Jack would love it and boy was I right. 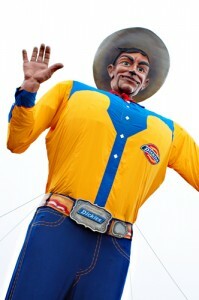 He still talks about the trains and BIG Tex! Alan’s work had a “fair day” last Wednesday so we decided to take advantage of the smaller crowds during the week plus they were doing a “bring three canned goods and get in for $1″ special that day. Can’t beat that! There is just something comforting about the fair – it feels like home. Alan and I both always enjoy the car show but Jack thought it was his own HUGE personal car playground! He jumped in and out of every car he could get his little hands on. 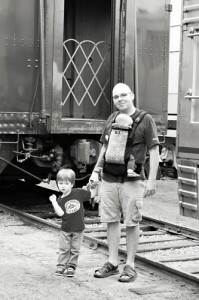 The best part of the fair by far was the first place we went; the train museum! 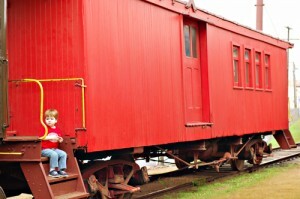 You could actually walk in and out of real train cars. 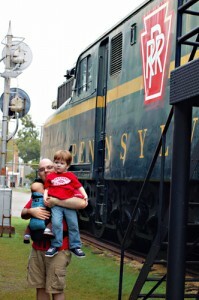 There were dining cars and sleeping cars – engines and cabooses. It was a HUGE hit! 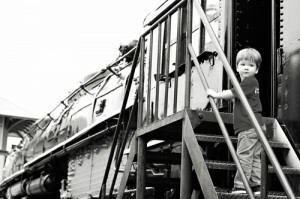 Jack was sure to remind us all what the “WOOOO WOOOOOO” of the train sounded like as often as he could! We took this picture to show Alan’s grandfather. He worked on the Pennsylvania Railroad many, many moons ago. What would the fair be without horribly unhealthy food too? I don’t often allow myself to indulge quite like I do at the fair - but as I said before, I haven’t been to the fair in many years, so I was due! First stop was funnel cake. 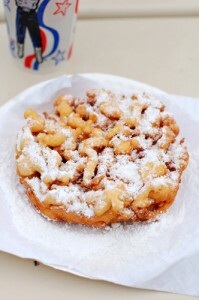 Oh the joy that is funnel cake! 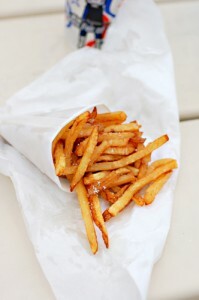 Look at that greasy, sugary loveliness! Jack got to have his first funnel cake too! 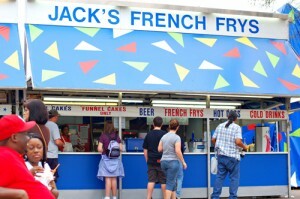 Next up were Jack’s Frys. Can someone please tell me where these have been my whole life? Other than funnel cake, I don’t believe I have ever experienced such a decadent taste explosion! It was the perfect combination of grease, salt and vinegar. They were delicious!! Still haven’t figured out that spelling – but I will forgive them – and eat more frYs! 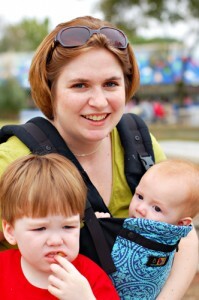 Nothing like a lovely pic of me with my boys! Nice look, Jack. Hey, I can’t really blame him. We knew full well we were skipping his beloved nap that day. He actually did pretty well, all things considered. 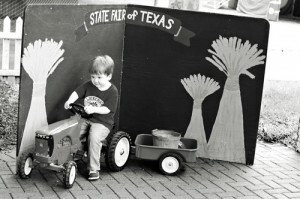 Jack got to practice his skills as a farmer in a little farm town where you could plant and harvest vegetables, milk a cow, feed chickens and Jack’s favorite – ride a tractor! Colin had the best seat in the house. He sure didn’t let a little fair get in the way of his nap! 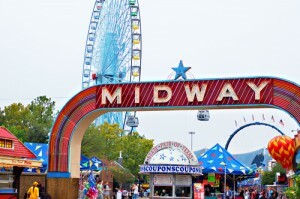 Goodbye State Fair – see you next year! So God sure does have a way of showing me how silly I am being sometimes. Here I was whining about a messy house and being broke when all of a sudden Colin rolls over for the first time thrusting me back into reality. I can’t lose sight of all of the many miracles that happen every day in out lives. Having an ever changing, ever growing, ever learning baby is a great reminder. This is really emotional for me because I realized that rolling over is such a “gateway” milestone, if you will. 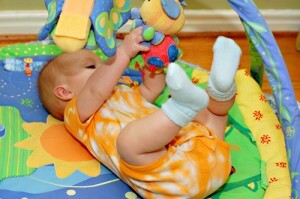 The cascade of developmental milestones is in overdrive now. 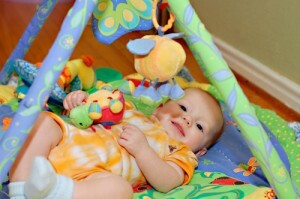 Next he will be scooting around on his belly, sitting up, crawling, pulling up, cruising and *gasp* – walking. 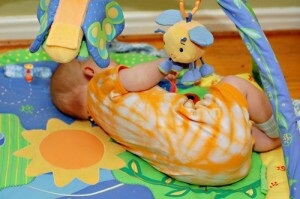 Rolling over is just the beginning of leaving “baby” behind and moving into “boy”hood. I could have never asked for a more amazing, joyful, happy and loving baby so I am sure he will continue to blow me away as he grows. Please excuse me if there are a few tears along the way, though! Trying to get some momentum going. Maybe if I grab onto these hanging toys I can get a little more force behind me. 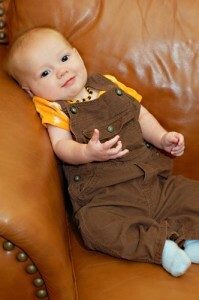 Why Mommy takes pictures of me looking like a big boy in my cute corduroy overalls, that’s what! BTW, my sweet boy turns 5 months tomorrow. 5 months! Wow! THANK YOU LORD!! Still being sick but well enough to want to do things but no energy to do them with combined with gloomy weather, no sleep and a messy house gives me the blues. Yep, the blues. Jack had them too this morning. When I took him to preschool he had a full out melt down which is not normal. I have been praying that he cheered up and had a good day. It is so hard to get caught up on life after being down for the count for almost two weeks. The house is embarrassingly filthy, I am losing track of what laundry is clean and what is dirty, I have NO desire to cook and thus want to go out to eat but we are in our “new” stage of life where we have NO money to do such things – so we are back to square one. I say we have no money – but we are blessed to have all of our bills paid, food in the fridge, gas in our cars and clothes on our kids – we are rich – I know that. We just can’t do anything extra right now. Anything. I am trying to figure out how to even put together all of the Halloween costumes this year and buy a baby shower gift and start Christmas shopping. Ugh! I think I have figured out part of it, though. As much as I LOVE getting a little alone time and I LOVE that Jack gets great socialization and learning time at preschool – I get lonely on Tuesday and Thursday mornings and start to think too much. I am used to noise in the house. I am used to whining and messes. Colin sleeps most of the morning and then I feed him and then it is time to go get Jack. If there was more time to actually go do something, that would be different, I guess. Instead I start to stew about all the things that I should be letting God take care of. Well, I guess 1 prayer was answered – Colin is awake. Off to feed the babe. …to put it mildly. Yes – I had the piggie flu. It knocked me on my proverbial arse almost two weeks ago. We had already been on an immuno boosting regime of vitamins D3 and C etc. as well as probiotics and echinacia so I added Oscillo to the mix; a homeopathic anti viral med. I didn’t want to go near Tamiflu because of the possible side effects to me, but mostly because of Colin nursing. Yes, the flu itself lasted almost 7 days but I really feel like that Oscillo helped from making it get as bad as it could have been. I never ran a fever, I just hurt – badly. I would alternate Tylenol and Advil for pain and sleep as much as possible. It was hell. Alan took as much time off work as he could to help with the boys which made a world of difference! I was afraid but determined to not let the boys get this knowing that since they live with me, their was a high likely hood they would. I kept Jack on his vitamins including all the ones I listed above and also started giving him small doses of the oscillo. We kept him away from me as much as I could, but there is only so much you can do to keep a 2 year old away from his Mama. I was the most confident that Colin would stay well because he is breastfeeding. I knew he would be getting all of my antibodies in him making him immune. 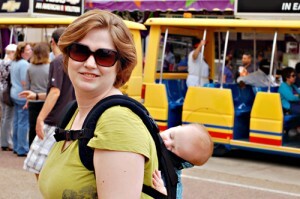 It took my friend Jessica to point out the most obvious prevention with Jack – pump my breastmilk and give it to him! DUH! My brain wasn’t working clearly – so I appreciate her suggestion. I don’t pump a lot of milk easily but I was able to get him some and I think he was really honored. It was so cute to see his face light up when he asked if the milk I was “making” (pumping) was for Colin and I told him it was for him. He was so excited to get to drink Mama’s milk too!! It actually made me very proud to be able to do that for him after having to give up breastfeeding so early with Jack. Thursday night I went to bed feeling worse that I ever have in my life. I was in horrible pain and freezing cold! I put on many layers, blankets and even a heating pad. In the night I woke up drenched in sweat and just poured sweat for hours. It was as if the flu was literally leaving my body at that time. It was really a remarkable thing to behold. I prayed before I went to bed the night before that God would take this illness from my body and He did! Friday was our 5th anniversary so I was determined to be well enough to go to dinner. Little did I know there was this little thing called bronchitis beginning to fester in my lungs. We went to dinner, but it wasn’t pleasant. I woke up Saturday morning and went to the urgent care doc who gave me meds for the bronchitis. I am still hacking up a lung even today, but I know I am finally on the mend! Best part – the boys NEVER got it! Looks like they have tough little immune systems after all!! I am still trusting God’s power over their immune systems to those immuno- killing flu vaccines! Thank you LORD for protecting my boys! All three of them. 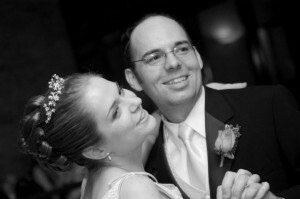 Today marks 5 years since Alan and I were married. In some ways it seems like it has been only 5 minutes and others is feels like a lifetime. Five years ago Alan and I probably felt about 10 years younger than we do now – looked 10 years younger too. Just being honest. I was teaching middle school art and hated it – hated middle school, not art. Alan was working nights at WFAA. We felt like roommates for the first year of our marriage. Alan went to work before I got home from work and went to sleep before I got up. I have always joked that that was the best year of our marriage. It was almost like we were still dating that first year. We only really saw each other on the weekends and were sure to make the most out of our time together. Sometimes we would meet for dinner during the week on Alan’s “lunch” break which felt like a date. We rarely had arguments because we never saw each other! It was also nice because, at least for me, I was so used to living alone and being independent – it was a good transition for me to get used to living with a boy. Once he moved to working days, we certainly enjoyed that too. Five years ago we were horrible stewards of God’s money. We thought we had a decent grasp on our finances but not until God placed Dave Ramsey in our lives did we truly turn our financial life around. That has probably been the most powerful change in our marriage – being on the same page financially and understanding that all that we have is for God and not us. I can’t even imagine – and frankly don’t want to – where we would be today if we had not made that change. As much as I can’t imagine my life without them and hardly remember a time when I wasn’t chasing them around - Jack and Colin didn’t even exist – at least physically. We knew we wanted kids and we knew we wouldn’t wait long to try and have them but we were determined to spend the first year cramming as much in as we could. Alan took me to England and Paris. We camped whenever we wanted to. We traveled to several places in the US, just because we could. It was a fun year – but I would never trade the time we have had with the boys for a million of those years! I love you, Alan! I love you in ways I never knew I could love. Not only have you taught me how to love deeply but you have taught me how to let myself be loved. Happy Anniversary!! From the day I met you I knew I wanted to be your wife! You have given me more than words can say! And he’s walking – again! I feel almost like I did the day Jack learned to walk the first time! Jack got his cast off today and upon first reactions I thought it might be a few days before we had Jack walking again but this afternoon when he needed to go to the bathroom instead of picking him up I held his hands and started walking backwards – and he followed!! He walked all the way to the bathroom and back – holding onto my hands. 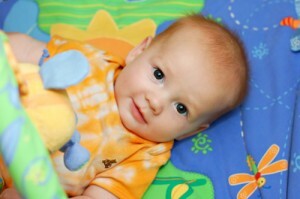 Everytime he would start to crawl I would say to him “but Jack, you can walk again, remember! ?” and he would get a look like “OH, right!” and he would start to walk – usually holding on to the table or couch. 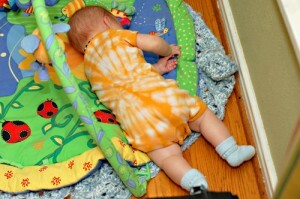 After an hour or so of that he would take a couple of unassisted steps and then fall. After dinner, though, he just took off! There was no stopping him! He was so happy to be walking again. At one point I asked him to come see me and he said “I can’t stop Mama, I gotta walk!” He was all wobbly and careful like he was when he was 14 months old. It was a beautiful thing to see. I am so proud of his determination and joy! I had to put these two pics side by side. 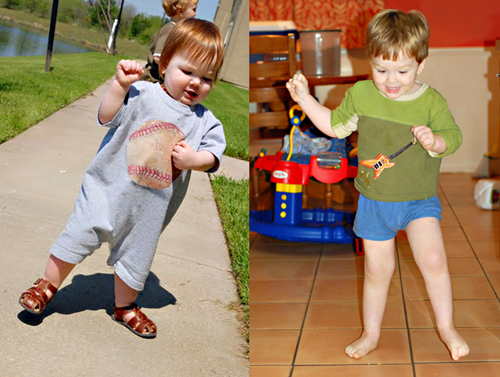 The left one was taken when he was about 14 months old when he took off walking on his own for the first time and the right one was tonight. It is crazy how similar they are. His arms, hands – too cute! The best part about today beside the “VERY COOL SAW” they used to cut the cast, was that he could finally take a real bath again complete with bubbles and toys! YAY for normalcy! Praise the Lord for healing my boy!! Us Melsons have just been trucking along as we rounded out September. Jack continues to LOVE preschool. He goes on Tuesdays and Thursdays from 9-2. The only draw back is that he is still a serious napper and he only gets about an hour and a half there when at home he might still get as much as 3 hours. All that means is that we need to be very diligent about getting him to bed early on those nights or else he is one red hot mess! My photo business is doing amazingly well! I am almost booked solid between now and Thanksgiving. I am having a great time chasing all those cute kids around and capturing fun memories for all those families! I LOVE my job! Plus, if all goes well I will be able to order my new camera in time for Christmas!!!! Praise the LORD! Hopefully the spring will bring it a new lens too – but that costs more than the camera! I have never felt more called to do a job in my life so I know that God will provide the tools necessary to do it!! The biggest roller coaster ride I took this month was along side my oldest and dearest friend Gina. 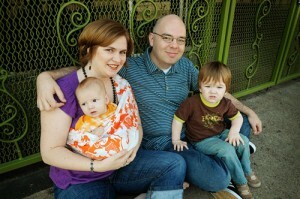 You may know that she and her husband Jason are in the process of adopting from Ethiopia. A week and a half ago, about 9 months earlier than expected, they got a referral and pictures of a sweet little 4 year old girl. They had been expecting siblings but were elated with the news that they were going to have a new daughter and much sooner than expected. The very next day the worst happened and the referral was pulled with no explanation. We were all devastated but mostly my sweet Gina who had taken such a huge step of faith and promised to be the mommy to a little girl she had never met thousands of miles away but instantly loved dearly. It was heartbreaking. It was surreal. God, however, was not heartbroken and was not shocked. He knew! Gina kept her faith and trusted in the amazing God we serve. The following Monday Gina got another call from her adoption agency telling her that not only was she getting her daughter back but that she had a 2 year old brother!!!!! That is the reason the referral was pulled but they couldn’t tell Gina that at the time. There are so many amazing ways God was working through all of this and Gina tells it far better than I could so if you want to know more – you can read her adoption blog. Praise Jesus!! I cannot contain my excitement! We might have these two angels home by Christmas! Yes, I said WE! Gina knows she can’t keep them all to herself! I am Aunt Emily after all! haha!! I will post the rest of our happenings in another post! Baby needs some feeding!